Of course, soon after the elation wore off, we realized that having reservations at a hotel would probably be a good call. Remembering a review I had read in National Geographic Adventure magazine two years earlier, we grabbed a cab and asked for a ride to the Atlanta Hotel. I’ll probably be the hundred millionth person to review this place since it’s been around since the fifties, but the Atlanta is truly incredible. 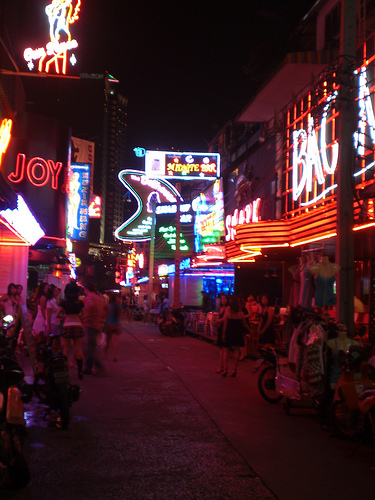 There is no place in all of Bangkok that can better prepare you for arriving in Bangkok. While the rooms are nothing special, the lobby looks like something you’d see in an old black and white movie. Wandering around you can discover all sorts of handy items such as the handbook for new arrivals and the preprinted instruction cards on how to get to the popular sites. The restaurant has a menu of traditional Thai dishes that reads like a novel on the gastronomic history of Thailand (mom you would love it). 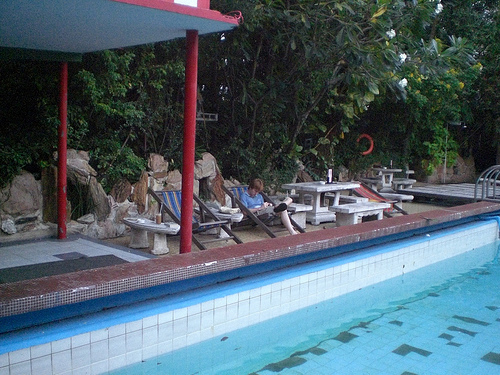 The back courtyard has a lush garden that opens up to a swimming pool surrounded by lounge chairs and hammocks. I thought the best touch was the creamy pineapple smoothie delivered to us upon arrival. As one reviewer wrote, you do not need to bring reading material when you come to the Atlanta. Besides the book exchange in the restaurant, the hotel is littered with signs and handbooks written by the hotel’s late proprietor, Dr Max Henn who is blunt about everything to say the least. My favorite sign was the one in which Dr Henn tells guests that, at these prices ($26 per night for us), you are not allowed to complain. The main reason that I wanted to go to Thailand so long ago was that I knew the culture was completely different from my own and I was craving some culture shock to wake me up from my tired routines. Well, Thailand delivered with abundance. So much so that I have no idea what Gage will write in his Culture Shock column because everything falls in that category, from the smells in the streets, to the hairstyles on the young kids. I mean, you walk down these incredibly torn up sidewalks that makes you wonder whether or not they make wheelchairs with the types of tires one would find on a tank, and you can’t help but notice that every ten feet a new smell accosts your nose. One minute you smell the stench of a nasty overflowing sewer, ten feet later you get musky perfume from a sidewalk vendor, then a few more steps and your breathing spicy curry from a food stall. Combine that with the intermittent honks from cars passing by, the vigorous solicitations coming from shop owners, and the bright blinking lights from the malls that pop up every other block or so, and you have an intense sensory overload. 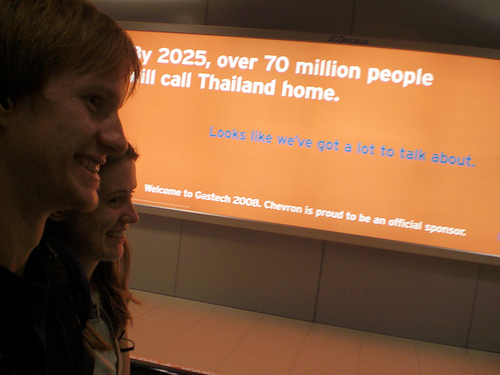 As exciting and fun-filled as Bangkok proved to be, Gage and I were eager to move up north for two reasons. One, cooler weather as every day proved to be around 95+ degrees. Two, Bangkok has so many cars and so much visible smog, it makes LA look like fresh mountain air. We stuck around for three days, which was long enough to visit the Chinese district, Lumpini Park, and the American Embassy. If you have ever been to Chinatown in NYC or San Francisco, don’t worry about visiting the one in Bangkok. Apparently all Chinese immigrants share the same blueprint. Lumpini park has smatterings of little pagodas in multiple ethnic styles. It also has an outdoor gym, much like muscle beach, with all of the same eye candy and about double the heat. 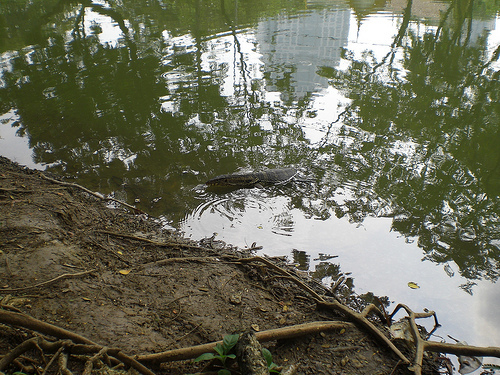 If you visit, though, keep your camera poised for the Water Monitor Lizards. There about the size of your leg and reside in the sewers and lakes. Petting is not advised. Our visit to the American Embassy was an attempt to do our patriotic duty and participate in this year’s election. For anyone who has ever wondered, applying for an absentee voter ballot is fairly easy…if you have an address. Apparently Mecklenburg Country, North Carolina is still stuck in the stone age because they will only mail or fax your ballot to you. Not exactly a backpacker friendly situation. Luckily a nice gentleman on the CouchSurfing network came to our aid and has offered up his address to receive our ballots and deliver them to us. If any readers have any pull in this area, it would be lovely if someone could get North Carolina’s election board an internet connection and email address. I have had several friends ask me whether or not citizens of other countries have an opinion on our election. Well the answer is an emphatic YES! In fact we are frequently asked about whether or not we will vote and who we think will win. I decided back in Romania to do some informal polling and ask these people who they would vote for if they could. After touring through 7 countries and asking around 50 people I only found two people who would vote McCain and one that didn’t have an opinion. Not only do most people ask me to vote for Obama, but I even had one guy try to give me money to donate to his campaign because foreigners are not allowed to contribute (I declined). Almost every day Gage and I see Couchsurfing members from different countries posting requests to have people host them while they are visiting the USA to campaign for Obama. I’m not trying to be biased here, in fact I was a McCain supporter the last time he tried running, but the international support for Obama is absolutely overwhelming. I just can’t help but feel like that’s something to take into consideration. For more pictures from Bangkok, click here. – The pollution in the city is pretty heavy. If you have asthma or sensitive lungs or simply don’t want to remove a few years from your life, get a paper face mask. A lot of Thais wear them, so you won’t be alone. – Tuk Tuk drivers are often very aggressive. They will honk at you as you walk down the street and often pull over to ask you where you’re going. Just keep walking and shaking your head no, but with a smile on your face. If a driver actually walks up to you, again smile and say no thank you to all of his questions. The city streets are packed and traffic is horrid. Do your part to help by taking the metro or the sky train. – Eating at Cabbages & Condoms where good food and good ethics go hand in hand. All proceeds go to PDA, a non-profit organization teaching the Thai community about birth control and AIDS prevention. 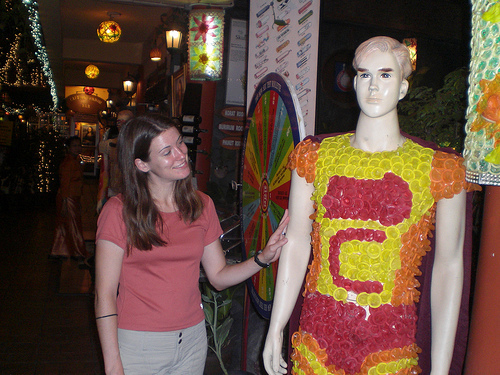 The proprietors have an excellent sense of humor so expect to be seated in a room with an abundance of condom decor. Congratulations on realizing your dream. You and Gage changed the channel of life and found one much more interesting than the norm. What’s even better, from your initial read-out, it seems that on this particular channel the color, contrast, brightness and sound have all been turned up to eleven! Really glad you two got to Thailand, thats great. To update you on the election, according to the polls McCain keeps losing ground and Obama is staying about the same, and Obama is leading. Hope you two have a great time in Thailand.